"[Peggy Larson] has assembled an engaging, thoroughly readable compedium of personalities, news clips, history, comments and quotes. It is a recap for old-timers and an appealing introduction for newcomers." On Labor Day 1952, the half dozen staff members of the Desert Museum waited nervously to see what Opening Day would bring. Would anyone make the long, hot, dusty drive from Tucson to visit the new museum? To their delight more than a thousand people came that first day. And they have never stopped coming. This visually-exciting new book, written by someone who lived and worked at the Museum during its first two decades, is anything but a dry collection of historical facts. It recounts, in lively prose and vivid photography, 50 years of the personalities (both human and animal), exhibits and events that have made the Arizona-Sonora Desert Museum an internationally-recognized, and much-loved, institution. 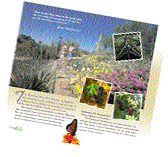 Arizona-Sonora Desert Museum: A Scrapbook profiles an institution whose activities and programs are diverse and far-reaching: world-class exhibitry and environmental interpretation, important scientific research, public outreach and environmental education. But the book also shows the lighter side of the Museum: a director who took scientific notes after being bitten by a Gila monster, a bobcat who became a movie star, a mountain lion who was ticketed for speeding, a bighorn sheep who swallowed time. Peggy Pickering Larson and her husband Merv, who later became director of the Desert Museum, worked and lived at the Museum beginning in 1953. Peggy, who is the author of a number of books, including The Deserts of the Southwest (Sierra Club Books), is currently the Museum's archivist. When Peggy Larson set to writing a scrapbook for the Arizona-Sonora Desert Museum, multitudes of interesting stories poured from her pen. In the interest of space, portions of many of those stories and profiles had to be left out of the book. Thankfully we have plenty of space on this website to let more of Peggy's writing see the light of day. Enjoy the supplemental "extensions" to our Scrapbook here.